There seems to be little appetite these days in the international community to challenge the legitimacy of Syrian President Bashar al-Assad and his brutal rule, especially in the Arab world where some tyrannical rulers are actively trying to normalise his regime. Thank goodness, therefore, for the actions of some heroic individuals and groups who are prepared to make a stand against this vile dictatorship and at least give some real meaning to the recent cries from Holocaust Memorial Day of “never again” when it comes to genocidal tendencies. Assad can never be viewed as being a solution in the driver to end to this civil war which began in March 2011. Shocking images smuggled out of Syria in August 2013 revealing genocidal actions by the Assad regime are today conveniently ignored, or even worse forgotten. Personally speaking, I am still haunted by the harrowing accounts told to me by Syrian women who were torture victims in prisons in Aleppo, Homs, Damascus and elsewhere. The abuse was on an industrial scale and I despair at the lack of will and moral compass of presidents and prime ministers from East to West to see this war end. And now there are signs to try and normalise Assad’s behaviour including the opening of embassies and a visit by Palestinian leader Mahmoud Abbas. Surely if any nation knows the pain of brutality and violence at the hands of a repressive regime, it’s the Palestinians. While I will support the Palestinians in their determination to get justice, I will not give the Palestinian Authority or its fickle leadership unconditional support to kiss the feet of brutal dictators. The Syrian conflict is complex and far more difficult to understand that a war between two opposing armed forces. Despite what left-leaning conspiracy theorists will have you believe, the democratic uprising against the regime began over the arrest, detention and torture of a group of schoolboys in Dar’a as I revealed in detail back in 2014. It did not begin with CIA interference, nor an influx of foreign fighters, Al-Qaida, rebranded weapons from the West, NATO or a global call across the Muslim world for jihad. This was a reluctant revolution, a revolution forced on the people by the acts of an evil, malevolent regime. Mercifully, while politicians with the attention span of a water gnat have grown weary and tired over the very mention of Syria, ordinary people are standing up to and taking action against the regime. For this very reason, there are flickers of concern and rumblings among the privileged elite surrounding President Assad. While state leaders and the UN seem powerless to do anything constructive, extraordinary individual efforts fuelled by exceptional determination can bring about the seeds of change. I saw two examples of it in the last 48 hours and these herculean efforts could force a change in direction of the Syrian war if only the international community can show similar courage and leadership to bring an end to the Assad regime, its brutal rule and the sectarian strife which has ripped apart the region. The first signs came when an American court ruled that the late journalist Marie Colvin was murdered by the Assad regime during an artillery attack in Homs in 2012. Her death was not just another random casualty of a war but, following an exhaustive inquiry, Judge Amy Jackson ruled she was deliberately targeted as part of the regime’s settled policy of violence against independent journalists, whom it considers “enemies of the state”. The court in Washington was told this campaign of violence continues today. Judge Jackson declared: “Officials at the highest level of the Syrian government carefully planned and executed the artillery assault on the Baba Amr media centre [in Homs] for the specific purpose of killing the journalists inside.” Colvin and a French photojournalist, Rémi Ochlik, who also died, were “specifically targeted” in order to silence their reporting of the growing opposition to Assad’s dictatorship and atrocities committed by regime forces. While it is unlikely Colvin’s family will ever see or benefit from the court’s award of $302m (£230m) in punitive damages against Assad, his brother, Maher al-Assad, and their associates, the verdict opens the way for the seizure of some or all of an estimated $1bn in Assad family assets salted away around the world, some of which have already been identified and frozen. The premeditated murder of Colvin should now also form a part of the ongoing UN-led criminal investigations of Assad which seems to have stalled recently. But make no mistake, this has only come about through the determination of Colvin’s family to get justice for this incredibly brave journalist who in death may just yet achieve as much for the innocents of war as she did in her amazing life. Colvin was a former colleague of mine when we both worked at The Sunday Times and she was fearless in her determination to get to the truth and her defence of the vulnerable in conflict zones was breath-taking. As the verdict of her murder was returned in the US court in Washington, another group of equally courageous and determined individuals held a press conference in Idlib, in rebel-held Syria. The seemingly inauspicious occasion will be like a thorn in the side of the Assad regime as a civilian initiative called ‘The Unity Project’ was unveiled. Around 350 “ex-pats” from the West have come together in Idlib province to help Syrians develop and rebuild their country. Using a variety of professional skills including medical, education, engineering, science and media the group has networked extensively with Syrians on the ground, charities back home and each other to rebuild and open schools, hospitals, playgrounds and community hubs to help widows and orphans. Most of the ex-pats – or foreigners as the Syrians call them – arrived in the war-torn country more than five years ago “for humanitarian purposes”. Their decision to stay has cost some their British citizenship because of the simple, but the toxic narrative, that those leaving the UK for Syria can only be fighters or ISIS brides. Without their British citizenship, these Good Samaritans are exposed and vulnerable but most are too busy with their humanitarian work to legally contest the withdrawal of their citizenship in UK courts. While in Idlib, I met some of the founders of the Unity Project during my visit last month and was told by one: “There are no fighters in our group and our only motivation is to help Syrian people rebuild their own country.” Sadly, rather than be applauded for their work which has convinced many Syrians to stay in their country, some individuals have been punished by the British Government which has removed their passports. Undeterred, and arguably more determined than ever, the ex-pats came together on Thursday and unveiled The Unity Project. Far from seeing Idlib as “the last stand”, this group sees a turning tide in the fortunes of the Assad regime despite its powerful Russian and Iranian allies which are counting on the West’s growing fatigue and general malaise over Syria. I investigated their work in detail visiting schools, nursery and other educational projects the vast majority of which are women-friendly. More importantly, many of the jobs created by ‘the foreigners’ are for Syrians who are either qualified or being trained in teaching, humanitarian work and other employment initiatives. 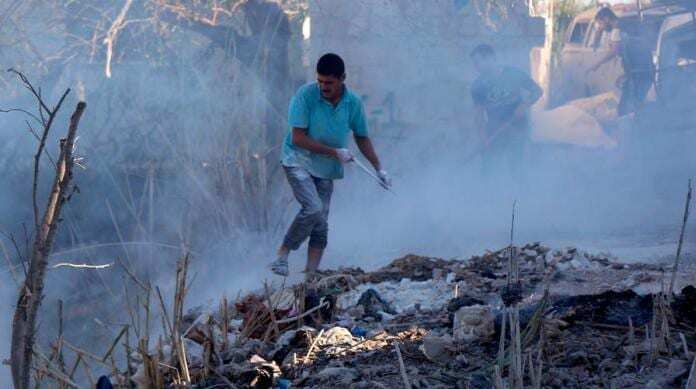 “If for some reason we are removed from Idlib the work we have done in the last five years will continue,” said the project’s general manager Bilal Abdul Kareem. Some may think his words are overly optimistic, I’m not sure. However, the international community must come together and support the Syrian people who want to live in a pro-democracy Syria and help them develop and rebuild their country without fear of reprisals from a vengeful regime. Assad can never be seen as part of the solution but maybe The Unity Project can be viewed as a positive grassroots initiative which is already convincing Syrians on the ground there to remain and rebuild. Instead of demonising the founders of The Unity Project maybe Britain and other countries should launch a thorough investigation to find out exactly what the ex-pats have achieved.